7 million twitter impressions in 4 days. #PASHAICT14. A hashtag tracking case study. “Entertainment and Perishable Information Leading upto a Transaction “. 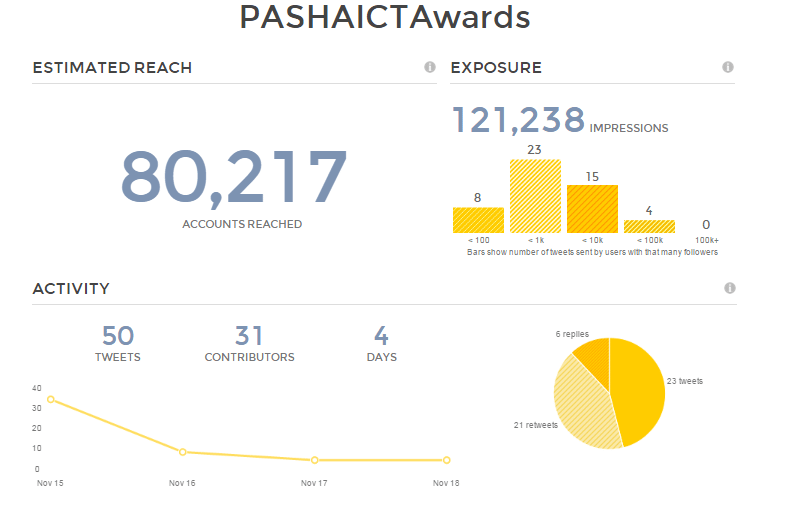 This weekend the PASHA (Pakistan Software Houses Association for IT and ITES companies) team ran a twitter campaign with a group of committed volunteers around the PASHA ICT Awards 2014 ceremony. Here is a sequence of events, interesting results and lessons learnt from the campaign over the last few days. 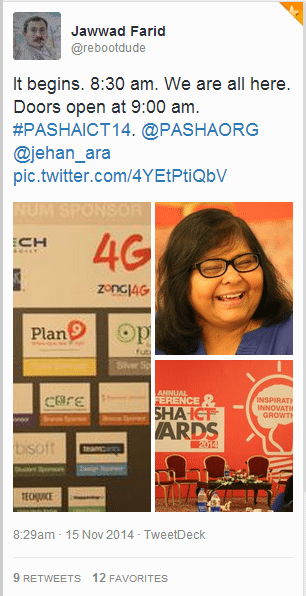 The event – PASHA ICT Awards 2014. The annual industry award attract as many 120 entries that are then judged across a range of categories for participation in the Asia Pacific ICT Awards. The awards have been running for the last 11 years and have turned into a flagship industry event that attracts over 1,000 technology professionals during its day long agenda. The morning and afternoon session include a conference with panel discussions with industry leaders, a high profile industry round table with key policy stake holders, followed by the Awards night. This year’s Awards night came with a special surprise. PASHA picked the event to break the news about its upcoming technology incubator for young startups in Karachi being setup with support and collaboration with Google, Samsung and the US State department. PASHA is essentially an industry secretariat with a very limited staff focused on servicing the needs of its membership pool. Much of the organization’s impact happens through its network of dedicated and committed volunteers who take charge and ownership of a specific push or project. In this specific instance three PASHA permanent staffers formed a core team that then fed tweets and content to a network of volunteers, followers and media partners. For the duration of the event, PASHA also used a number of student ambassadors and volunteers. Some of the student volunteers equipped with smart phones were also prepped for the event. Finally for the day of the event a 10 MB pipe with an industrial strength dual band router was made available to ensure that the audience in attendance could tweet to their heart’s content. 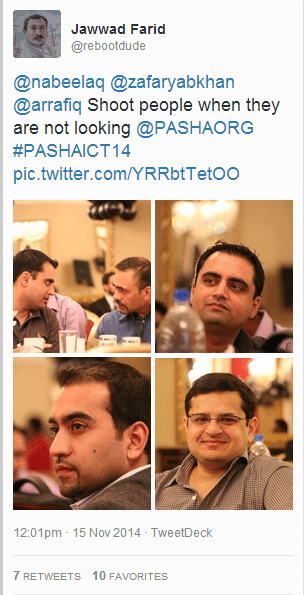 A short Hashtag #PASHAICT14 was finalized, tested and circulated two days before the event. Volunteers were updated about the plan of action for the event and the stage was set for the day. The first tweets using the Hashtag was circulated the day before. The first tweet on the day of the event went out at 5 am in the morning. The strategy was centered around the retweet reach of a number of influential members of the team with 20K and 30K followers each, the desire of winners and panelists to talk about themselves and the buzz created by the upcoming PASHA Tech Incubator in Karachi. To increase traction we also arranged for team members to post pictures directly to the event Facebook album as well as tweet selected images at a regular frequency during the event. It wasn’t enough to have just one point and shoot camera. A half way decent DSLR was decreed as a requirement and arranged for the event. Without the right measurement tools the effectiveness of the strategy couldn’t be measured. This year we relied on three tools to measure reach, exposure, impressions and effectiveness of the campaign. TweetReach, HashTracking & KeyHole. All three come with a free edition with limited functionality that can be used by a team in lean mode to gain reasonable insights about their campaign and its reach. TweetReach allows you to get a sense of who your most powerful influencers are. 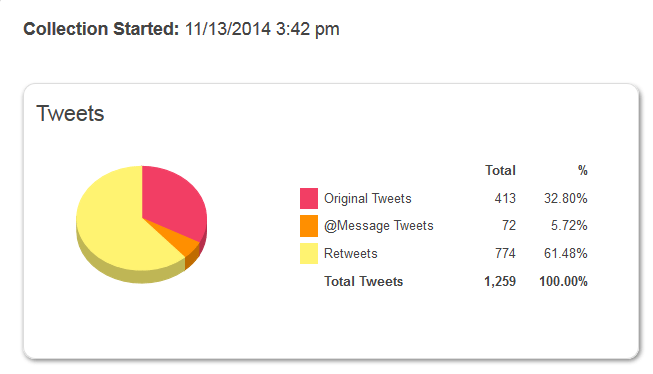 HashTracking gives you a full few of Timeline deliveries, reach and impressions. While KeyHole covers posts, users, reach and impressions in one easy to view and present dashboard. From a branding and sponsorship perspective, sponsors are always interested in tracking what coverage their contribution to the event generated for their brands. For event sponsorship, a credible history of reach and impressions goes a long way in building and defending a business case. For a technology event like PASHAICT14 conference and awards ceremony, the primary sponsors tend to come from the industry. For them credible relevant exposure and impressions across a qualified audience from the community armed with smart phones, twitter decks, opinions and fast fingers represents a far better return on investment than a simple print or outdoor media campaign. Would you rather reach a million students and technology entrepreneurs looking for fast 3G and 4G data plans on their cell phones versus ten million unqualified impressions that have nothing to do with the technology industry. 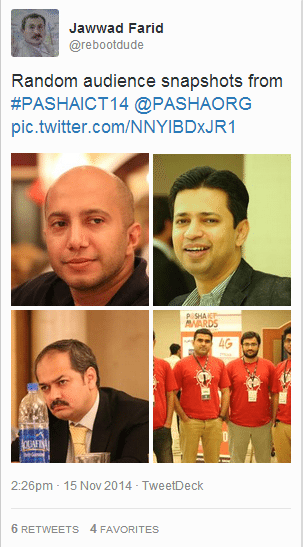 That is what Google, Samsung, IBM, Zong (China Mobile) and PTCL achieved at the conference and Awards night in Karachi. Here is what we learnt from our hashtag tracking dashboards. 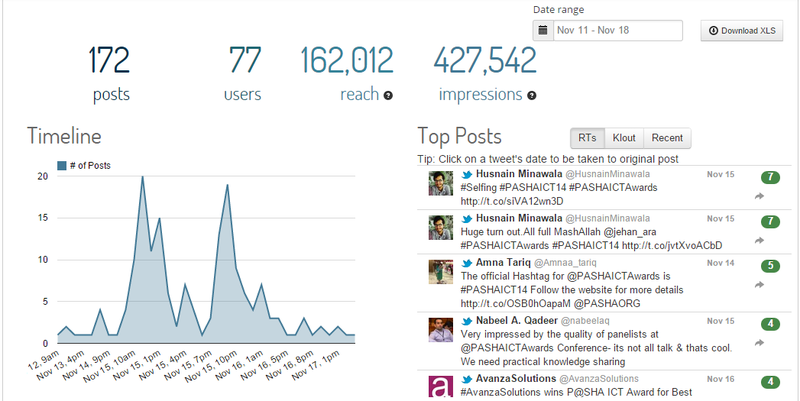 In terms of timeline deliveries and total impressions, the #PASHAICT14 hashtag had a retweet reach of 6.7 million timeline deliveries. That reach was achieved by 528 posts, made by 152 users and resulted in 800 additional retweets with the hashtag. 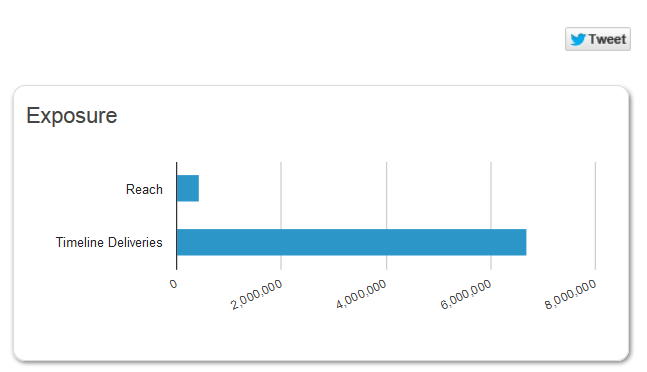 Total reach achieved by the hashtag was 400,000 over 5 days (13 – 18 November). 13th and 14th were pre-event days, 15th was the event itself, while 16, 17 and 18th of November generated stories, tweets and retweets around themes, discussions, debates and news triggered by the event. From a marketing, branding, impressions, mindshare and traction point of view the campaign was a respectable success. We had aimed for trending in Karachi but our city with 23.5 million residents is slightly larger than Australia (23.13 million). Two political debates and a political rally fired up twitter sphere on the same weekend. 12 months ago in Islamabad (population 2 million) trending the PASHAICT Awards 2013 Hashtag had been a lot easier and simpler. In Karachi despite a much larger pool of volunteers we failed. Internet connectivity and a large pool of volunteers armed with twitter accounts and Plume on their cell phones is a must. If you are aiming to trend active participation of the audience is a must. You have to engage them, brief them, inform them and share the HASHTAG for the event with them ideally before the event or during the event using prominent locations. HASHTAG confusion. Due to a last minute change and oversight, the branding collateral for the event shared a different HASHTAG. Even though the issue was partially fixed before the launch of the event, the damage was already done. Two key partners for the event initially used the original hashtag. In terms of slippage that cost the twitter reach for the new tag about 150 tweets, 162K in reach and just over 400K impressions. If we had successfully plugged the leakage, the final numbers would have been even more impressive. Buzz Half Life. 3 days later, the buzz generated by the campaign and the hashtag was still creating conversations, impressions and posts. 4. Planning and pre-briefings. To avoid last minute panic mode decisions it is important that volunteers, team members and influential members of the audience are briefed personally a week before the event. Trending and tracking a HASHTAG takes a great deal of coordinated work and effort and without the right combination of timing and effort, it is impossible to deliver on that promise in a large city with multiple focuses. While we certainly created a remarkable result, we did fail in meeting the primary objective of our twitter strategy. 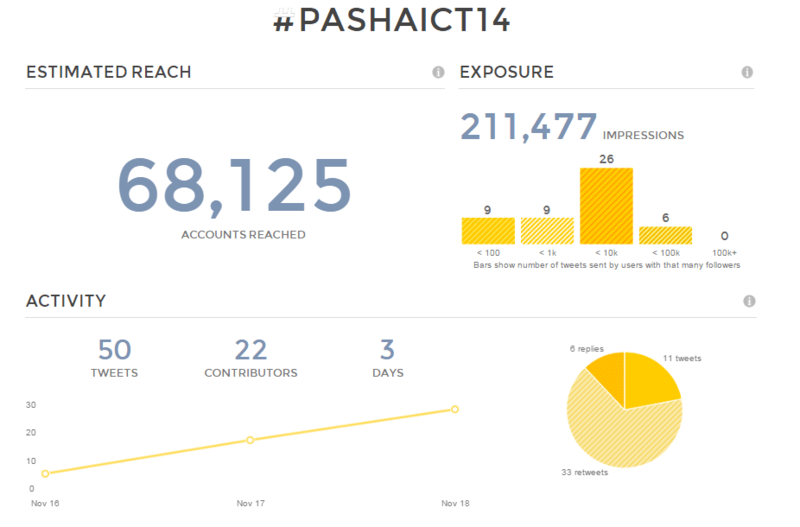 Trending #PASHAICT14. Previous Previous post: PASHA Tech Incubator. The Nest io. That morning in KL that started it all.